The 2010 World Cup in South Africa was a numbers bonanza. An astounding 530.9 million viewers tuned in to watch Spain defeat the Netherlands in the final, and more than 3.2 billion people –– or 46.4 percent of the population –– watched some portion of live coverage of the entire tournament for at least one minute. You want one more? OK, how about 71,867? That’s the total number of hours of soccer that were shown to viewers. Today, few, if any, events command the type of attention and money the World Cup draws. Americans like to boast about the strength of the Super Bowl; however, the popularity of the NFL’s annual showcase is minuscule compared to that of soccer’s. Thanks to its growing viewership and lucrative advertising deals, the World Cup has become more than just a quadrennial tournament. For brands in particular, it’s their chance to capitalize on the attention of a global audience by extending themselves across multiple mediums. According to Forbes, FIFA stands to bring in $4 billion in revenue from the 2014 World Cup in Brazil, a 66 percent increase from the previous tournament. That includes $1.7 billion in television rights and $1.35 billion in marketing rights from corporate partners like Adidas, Emirates, Sony, Visa, Hyundai and Coca-Cola. AdAge points out that sponsors like Johnson & Johnson and Nestle are paying a combined $600 million to Brazil TV network Globo to broadcast their ads during World Cup play. Even the ads themselves are being watched by more viewers, thanks in large part to the dominance of digital media. 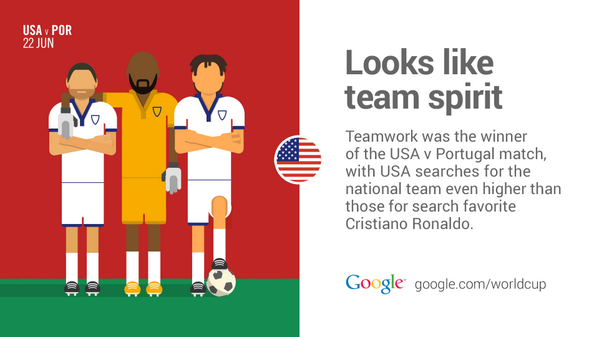 According to YouTube, World Cup ads are four times as popular as their American football counterparts. Fans have already spent more than 1.2 million minutes watching 2014 World Cup-related advertisements for brands as diverse as Samsung, Nike, and the Brazilian bank Itaú. Obviously, it wasn’t always like this. If you rewind back to the first World Cup in 1930, you’d see a popular sporting event with no television exposure and limited radio broadcasts. Attendance was uneven, with some matches bringing in only several thousand spectators (though, an estimated 93,000 did see the final game between Argentina and host country Uruguay). Back then, the idea of brands capitalizing on a sporting event was almost non-existent. With limited technology and little fanfare, the incentives were miniscule. That first tournament was about spreading the game of soccer around the globe, not the business of it. Today, money is central to the conversation. After that first World Cup in 1930, more countries began sending teams to the tournament, thereby increasing exposure and knowledge of it across the globe. That in turn created more avenues for brands to explore marketing to viewers. By 1982, advertisers were partnering with FIFA on a regular basis. One of the earliest sponsors to sign on to the World Cup was Coca-Cola, who began experimenting with more aggressive marketing tactics as the audience continued to grow. In “A History of the World Cup: 1930-2010,” author Clemente Angelo Lisi states that during the 2006 tournament, Coke erected billboards and aired TV commercials a year before the World Cup even began. They also paid for signs to be displayed in poorer areas of the country. By the time the tournament began, the soda maker was handing out cans to visitors coming through the airport. Ad campaigns weren’t always that clear-cut, though, as the influx of money and viewers into the World Cup’s universe would also end up creating conflicts between companies. In 2006, Adidas and Nike squared off. (Ed. Note: They're also squaring off this year, see what each side is doing to win.) As Lisi points out, Adidas was the tournament’s official sponsor. However, Nike was also involved that year, sponsoring several high-profile squads. That led to both companies stamping their logo all over Germany in an attempt to drown out the competition. That sort of carpet bombing approach to advertising was somewhat effective, but the game has changed significantly since then. 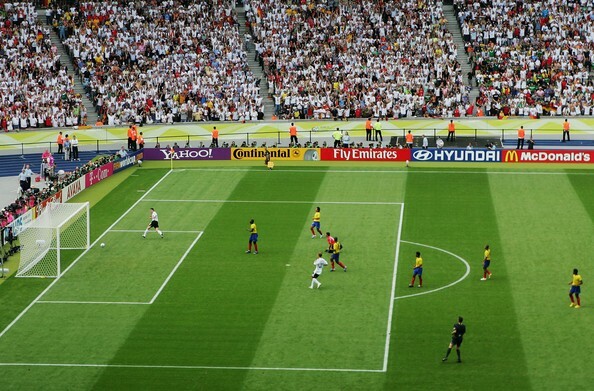 The 2010 World Cup represented the first truly concerted effort by brands to appeal to a global audience outside the traditional mediums. And while those ads were both good and relatively successful, the eyeballs they could reach were a drop in the bucket relative to what we're seeing this year. Another example can be seen from Nike. The company recently employed the help of spokesman and soccer superstar Cristiano Ronaldo, asking him to tweet out a new World Cup ad to his 26.5 million followers. He did it back in June, and the video is currently sitting at 53 million views. Even brands without a financial stake in the games have been getting into this year’s action. 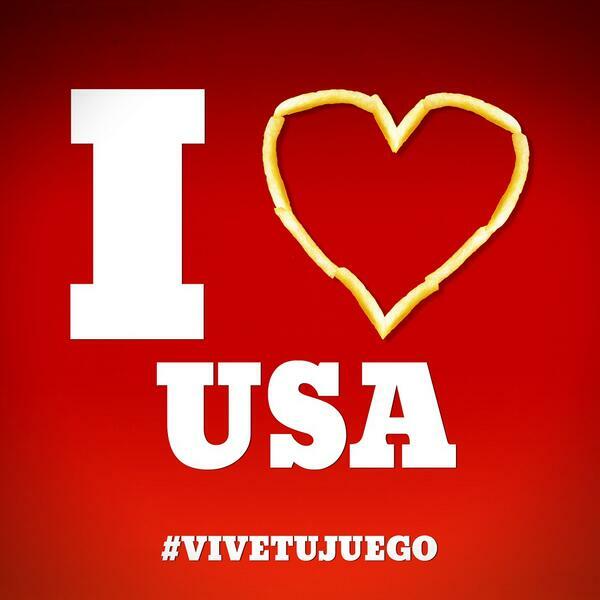 For Team USA’s game against Portugal, many American-based brands, from NFL teams to restaurants, shared messages of support on Twitter in an attempt to join the larger conversation. Brands are able to participate in the conversation happening around the World Cup without having to spend the significant sums necessary to become an official sponsor. The multiplying factor of both mediums with which to reach fans and methods for fans to consume content presents significant opportunities. So what does the current state of brand awareness and advertising at the World Cup mean for the future? In a digitally forward environment, things look promising, to say the least. If ratings continue to increase and if the use of social media becomes more and more integrated into the game itself, brands will keep spending more and more money. But as others have shown, the purchasing power of those dollars may be somewhat mitigated by the nature of social campaigns. Whatever the outcome, this year in Brazil, the World Cup is once again showing how dominant it is on all levels, for fans, for host cities, and for advertisers. Be sure to follow Engage Magazine on Twitter. And learn how ScribbleLive can help you learn to reach your customers, wherever they are.